I took a run today along the waterfront. Felt good to get moving after so long vegetating. Kei and Simon walked behind me to the Ferry Building. We bought some fancy food and had a picnic across the street at Sue Bierman Park. Simon enjoyed playing alligator with another kid who was Captain Hook in the pirate ship. He also liked the “big boy” slide. Kei and Simon got passport photos after from Leetone Photos. Quick and friendly service. They had a plaque on the wall that said “Rule #1: Take care of your customer or someone else will.” True, as we noticed a brand new “spanky” passport photo place moved in across the street. Leetone appeared to be from 1897, but efficient and friendly nonetheless. Later that day, I finally got fed up with my iphone lasting about 15 minutes without a charger and took it to the *ahem* Genius bar at Apple. They couldn’t replace the battery, so they gave me a new phone. It’s 18 months old, so I forked over $80 for a new phone. Not bad, considering I didn’t shell out 100 a year for apple care. Now, I am attempting to milk this one at least until the next iphone release. There are some good instructions at Apple for how to make an iphone battery retain up to 80% of its original life after 500 charge and recharge cycles. When I’m focused (via VitaminR), a photo by meherenow on Flickr. My concentration levels during the day. 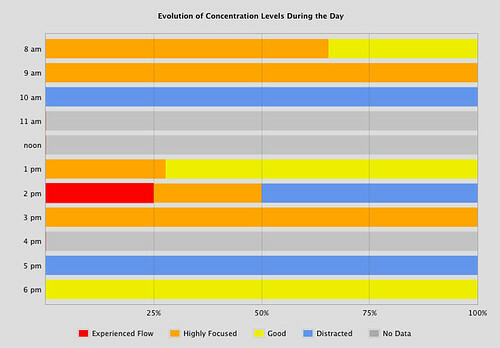 This shows a subjective evaluation of my level of concentration using the program “VitaminR” during the day. This data would indicate that the peak hours that I am most focused at creative activities like writing occur between the hours of 8 and 10, and then 1 and 3. It’s interesting to note that these are the hours directly after I eat. I wonder if the energy reserves that I need in order to do challenging things are limited. Research on dieting and willpower suggest that there is a reserve on willpower. I am going to use this to plan meetings, interrupts, writing and other activities. Beijing Trip, a set on Flickr. A trip to Beijing. I was there for business, but took a day to see a few things including the forbidden city, the great wall and wongfujing market. The people were great, the food was great, and the wall was really great. After months of my blog being hacked, I’ve finally set aside some time and cleaned out the site and removed the bad bits. I’ve now got a renewed appreciation for keeping software up to date. While for a little while I was about ready to throw in the towel and move my wordpress installation to wordpress.com, I think I’ll “give it another go” as Kei says, and see if I can’t keep meherenow pest free. My apologies for the delay. My boss sent this to me (he has two under 3 year old children). Good advice for would be parents. We’re expecting again. Yes, Simon was born only 3 months ago and we are already expecting. Except we’re not expecting a child, it’s a San Francisco Sourdough! Now that I’ve raised your hackles, let me say that those of you who wish to join me for Sourdough Pancakes in San Francisco with the true Lactobacillus sanfranciscensis may have the chance soon enough. I’m making two recipes. One wild yeast only starter and one from the Fields of Greens cookbook. As with any parent with multiple children, I’ll start comparing them and rating them as soon as humanly possible. Photos to come. My sister (Kate) got me this slightly bizarre head massager for Christmas and without a doubt doubt it is the most unique and amazing little product I’ve used in a long time. Just put it on your head and move it up and down. Guaranteed to give you lots of innovative thoughts, relax you, and possibly connect your thoughts to the aliens hovering above your head. I think I’m in love. There is a bike shop in Berkeley specializing in constructeur style bikes from Japan. I’ll try to get Paul to come down and visit. Thanks to Giles for pointing this out to me. About to try the famed Bulgogi Burrito.